Book Review | Your Health. Your Lifestyle. Join a book club. You and like–minded company can discuss a work of the month and socialize at the same time — these groups can be found across the country. Read outside. Catch some rays by taking your bestseller out on the porch, balcony, beach, or park bench. Go to a coffee house. Sit down, grab a cup, and revel in 2 pleasures at once. Buy a CD. Pressed for time? Audio books allow the option of listening in your car or on your headphones while exercising. New technology. If reading an “old fashioned” paperback seems passé, consider an e–book. Read before bed. 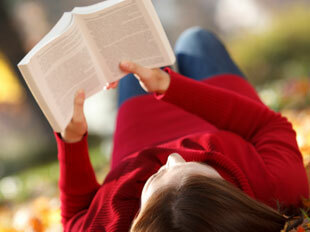 Those who start reading 1 hour before bedtime often fall asleep more quickly and sleep more soundly. 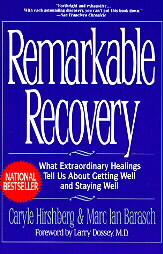 Remarkable Recovery: What Extraordinary Healings Tell Us About Getting Well and Staying Well, by Caryle Hirshberg and Marc Ian Barasch, 1995, 334 pgs., $12.00. At a time in medicine and science when researchers are peering into ever stronger microscopes to unlock the secrets of the smallest bits and pieces of the building blocks of life, Caryle Hirshberg and Marc Ian Barasch crash brazenly onto this intensely focused scene like uninvited guests at a society party, knocking over tables of carefully arranged hors d’oeuvres and talking about all the “wrong” things. When it comes to cancer treatment, they suggest in Remarkable Recovery, it’s time to step back and examine the big picture. Perhaps medicine’s reductionistic approach to understanding cancer has overlooked vital clues to possible healing options – clues found in the lives of people who have actually beaten the odds and survived “fatal” cancers. People like Mr. DeAngelo, an alcoholic who stunned his doctor by walking into the hospital 12 years after he was thought to have died from “fatal” stomach cancer, and Carol Knudtson, still alive more than a decade after a “fatal” fast-growing lymphoma disappeared from her throat, and Suzanna McDougal, an organic farmer whose “fatal” ovarian cancer dissolved between medical check-ups. Motivated by the tendency of many, though not all, medical professionals to label cases of cancer recovery as unexplainable freak occurrences that don’t fit easily into their understanding of the disease, Hirshberg, an author and cofounder of the Remission Project at the Institute of Noetic Sciences, and Barasch, an author and journalist, search out and interview dozens of cancer survivors to ascertain just what made them, and not others, survive. In the first eight chapters, Hirshberg and Barasch effortlessly juxtapose these engaging, story-like case reviews of cancer recovery with more rigorous explanatory information that attempts to investigate these complex factors. Like the aroma of hot cinnamon muffins passed under your nose at breakfast, these case histories linger suggestively in your mind as the authors build their scientific case for a mind-spirit component to cancer recovery. Their case rests on information from cancer researchers, non-traditional healers, psychologists, psychiatrists, physicians, and a wide array of biological and psychological studies. It also rests on evidence from religious healings, the complex linkage of your immune system with your nervous and endocrine systems, other substantiated connections between your mind and body (as demonstrated by biofeedback, hypnosis, and adrenaline and endorphin release in response to emotion), and your own biological healing mechanisms. This mind-spirit component is part of an innate healing system, they postulate in the ninth chapter, an unmapped super-system of the body and mind that performs three main functions: self-diagnosis, self-repair and self-regeneration. Day to day it is constant and unobtrusive, “the Acme Janitorial Service on perpetual contract for health maintenance,” continually flushing out bacteria and healing cuts and bruises. But when our bodies are threatened by potentially fatal disease, like cancer (or AIDS), “the mind is summoned to the engine rooms of the body” to unleash a constellation of factors that can rev up the healing system. These factors, which differ from person to person, range from biological mechanisms like nutrition, wound healing, immunity, genetics, and neurotransmitters to psychological mechanisms like emotions, belief systems, dreams and symbols, hypnosis, biofeedback, dissociative states, relationships, visualization, art, music, and the power of love. The key, Hirshberg and Barasch suggest, is to determine which factors work best for each individual. To this end, the authors in their final chapter call for the establishment of a registry for patients who have recovered from cancer and for medical professionals to open their minds and laboratories to the possibility of the existence of such a healing system. Four appendices expand this theme with a sample registry questionnaire, a sample survivor case report questionnaire, examples of survivors’ own descriptions of the impact of various factors, and a pilot study aimed at better elucidating survivors’ psychosocial characteristics. Ultimately, Hirshberg and Barasch aim to foster a medicine that can “color outside the lines: lines that sometimes artificially divide doctor from patient, fact from feeling, surgery from synergy, chemo from caring.” They also recognize that these sentiments may be a bitter pill for a medical tradition that has undoubtedly made great strides by reducing disease and healing to tinier and tinier physiological bits while shunning most broad-brush, yet potentially relevant, anecdotal and psychological information. “Remarkable recovery remains a continent of neighboring tribes inhabiting separate domains with scarcely a common language between them,” Hirshberg and Barasch conclude. “As with attempts of early physiologists to understand other now well-known systems, we can only impute the healing system’s existence from its appendages; collect such evidence . . . as we can; and hypothesize its mechanisms from the circumstances of inexplicable cures.” Only when this process has begun in earnest, they imply, can the party really begin. The Fat Blocker, by Arnold Fox, M.D., and Brenda Adderly, M.H.A. St. Martin’s Press, 1997, $22.95. I want to believe what I’m told in this book, badly. For if it’s true, then losing weight and lowering cholesterol are almost as easy as taking Tylenol. Here’s why. There exists a naturally occurring substance called chitin, found in shellfish shells and mushrooms. In 1859, for some reason, a professor Rouget cooked chitin in alkali and discovered that this new form of chitin, christened Chitosan, sticks to fat like gum on shoes. We can’t digest Chitosan, and when it passes out of us the clinging fat passes with it. Voila! Pop a Chitosan pill, and of the 24 fat grams you swallowed in your McDonald’s Quarter Pounder, 15 grams stick to Chitosan instead of your thighs. So your body now has to battle just nine grams of fat. And less fat means less calories and less cholesterol. Please, let it be true! Dr. Arnold, who practices privately in Beverly Hills, California, swears that it’s not only true, it’s also scientifically and clinically proven. He backs this claim with mountains of compelling examples of patients who’ve had amazing success with Chitosan, coupled with a brief nod to scientific research. Beyond Chitosan, he and Adderly do a good job of explaining in understandable terms the health problems associated with obesity, as well as the drawbacks of many popular diets, including the Zone, Scarsdale and Atkins diets. They also thoroughly explain their Eight-Point Fat Blocker Program, which involves a low-fat diet, exercise (sound familiar?) and, of course, Chitosan. They include tips on how to stay motivated while dieting and avoid dieting mistakes. The problem is that both the American Medical Association (AMA) and the American Dietetic Association (ADA) urge extreme caution when it comes to swallowing Chitosan, which is available in many health food stores. “If it sounds too good to be true, it probably is,” states ADA’s Maryanne Giustino. Neither she nor an AMA spokesman have even heard of Chitosan. I don’t know about you, but that makes me a wee bit nervous. An Internet search using the powerful Grateful Med search engine produced only a handful of relevant journal articles, few published in highly respected peer-reviewed journals and nearly all using rats or test tubes, not humans, for subjects. 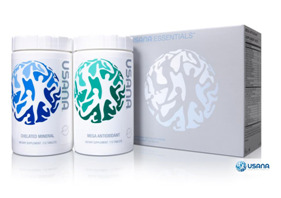 While these studies do suggest that Chitosan really does decrease fat absorption, they do not prove that Chitosan is safe and effective for humans as prescribed by Arnold. Now maybe the AMA, the ADA and I are just behind the times, and maybe in a decade we’ll all be gulping Chitosan right along with our morning vitamins, but for now, I’ll stick with jogging, skim milk and meal-time moderation to keep the weight off.